A contemporary newspaper article about Gordon Cooper's (1927-2004) spaceflight, including an interview with Dr. Calvin D. Fowler, the man who launched him. In particular, the article discusses Cooper's most recent spaceflight on the Atlas 130D, the process of launching spacecraft into outer space, the famous aviator Wiley Post, and Project Mercury. Original newspaper article: Private Collection of Dr. Calvin D. Fowler. Digital reproduction of original newspaper article. “Dr. 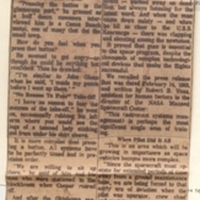 Calvin D. Fowler Interviewed After Astronaut Gordon Cooper's Spaceflight.” RICHES of Central Florida accessed April 22, 2019, https://richesmi.cah.ucf.edu/omeka/items/show/4994.